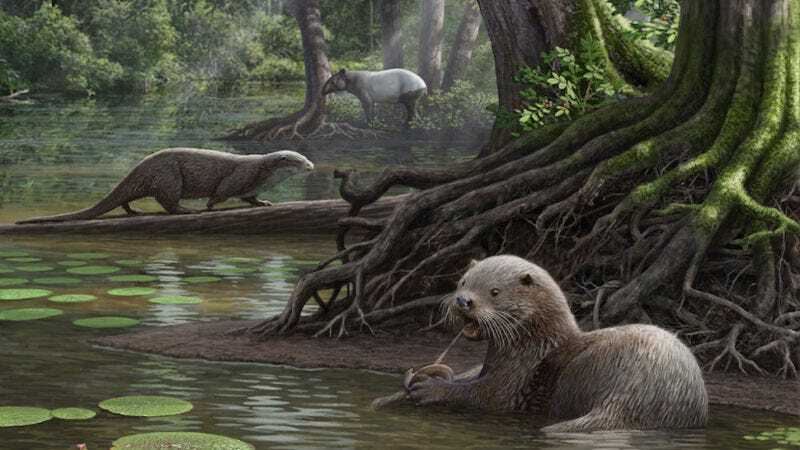 You might have heard about that insane extinct otter that lived around 6 million years ago and weighed around 11o pounds—about as much as a wolf. Further research shows its powerful jaw could have made it a dominant predator. Last we checked in, scientists wanted to delve deeper into studying this strange species, Siamogale melilutra. They had a complete skull and mandible specimen—meaning they could study its bite. And models show this otter had a powerful, shell-crushing jaw, one that could have put it atop the food chain. “The abundance of aquatic and near-water environments in that region,” swampy waters today located in southwest China, “may have allowed aquatic carnivorans such as Siamogale to become the dominant predators of their ecological communities,” the authors wrote in the study published today in Scientific Reports. The models began with a complex analysis of the shape and size of different otter mandibles, taking into account the amount of strain they’d be able to endure. The researchers saw that other otter jaws’ stiffness scaled with volume, where smaller otters had stiffer jaws. It’s kind of like a light dimmer, where sliding your finger down (smaller otters) makes the jaw stronger. But the model showed Siamogale’s jaw was six times as stiff as the expectation, as if you were sliding your finger up and suddenly the lights shut off (and you got mauled by a wolf-sized otter). The researchers published this analysis today in the journal Scientific Reports. Obviously this is an extinct animal so we won’t know exactly what it ate based on the shape of its jaw alone (at least not yet). Plus, this is just a model, and you may have heard the quote “all models are wrong but some are useful.” If its jaw really was this strong, though, it could have done some massive chomping unlike any other otter. “Our findings suggest that Siamogale does not have a living analog, but exhibits limited similarity to the living oral-crusher Aonyx in having significantly stiffer than expected mandibles among otters,” the authors write. Aonyx is a smaller otter species at only 20 to 50 pounds but can crush crab shells with its teeth. Now just imagine if it was two to five times larger. I kind of like the idea of an ecosystem ruled by enormous killer otters, don’t you?